This is a story about Millie the Grizzly and her cubs, and the interface between people and nature. The backdrop is Montana; the narrative is one that could be about many places on our beleaguered planet. 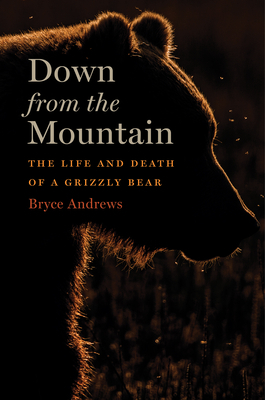 Nature prose this beautifully written is hard to come by these days – just like the creatures it is written about, and those who love grizzlies as I do (as my social media icon attests) will appreciate the opportunity to visit Montana through the eyes of the author. But this is also a narrative about what we are rapidly losing, and how much we will miss it when it is gone. Zoos can be a last refuge for many of our favorite critters, but it’s just not the same. Read Down From the Mountain and dream of better times, then maybe add your voice to the conversation about our future. BRYCE ANDREWS’s debut, Badluck Way, was the 2014 winner of the Barnes & Nobel Discover Great New Writers Award, the 2014 Reading the West Book Award for nonfiction, the 2014 High Plains Book Award for both nonfiction and debut book, and a finalist for the 2014 Washington State Book Award. Born in 1983 and raised in Seattle, Washington, Bryce Andrews migrated east toward the American West. Having spent a decade in the high valleys of Montana, he remains fascinated by the complex and reciprocal relationship between humans, wild animals and place.